If you are a big fan of Android, you probably know how awesome Google Voice is in letting you create a second number that you can use through your main device for free. 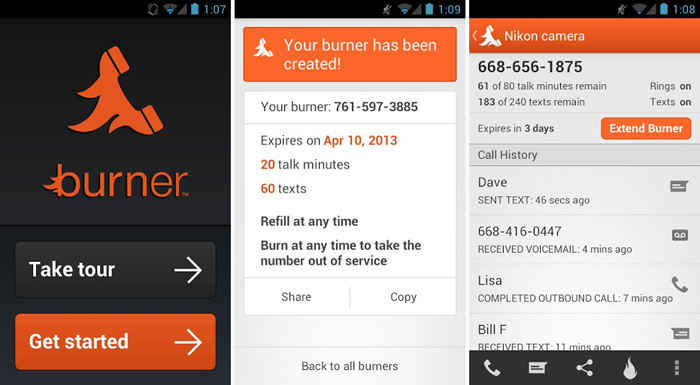 However, if you are looking for something a little more, disposable, Burner has just launched on Android and looks pretty slick. The app allows you to make a new number on your device and load it with pre-paid minutes, but if the CIA is ever on your tail you can “burn” the number and get rid of all your data. Now, we all might not be running from the government and trying to hide, but for people who are looking to sell things on Craigslist without giving out their actual cell number this could come in pretty handy. You can keep loading your new number with minutes and texts as long as you need them and it functions just as your normal phone line.